Looking to spice up your weekly dinners or sweeten your next family gathering with an extra special dessert? Bake-Off.com now has 100 new recipe creations from Pillsbury Bake-Off finalists from across the country. Whether you are in the mood for Breakfast & Brunches, Entertaining Appetizers, Dinner Made Easy™, or Sweet Treats, Bake-Off.com has tons of new ideas that are simple to make and sure to wow your loved ones. 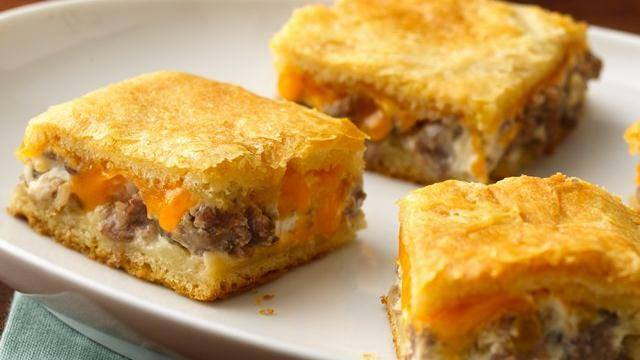 One recipe that my family enjoys making for special events is the Sausage and Cheese Squares. This recipe is SO unhealthy but when cut into bite size squares it's a tasty little appetizer for hungry guests. This is way easy to make, even my 6 year old can do it so no worries if you are afraid or don't like to cook. Everyone will think you slaved in that kitchen.